At approximately 2:00 a.m. on August 6, 1945, a modified American B-29 Superfortress bomber named the Enola Gay left the island of Tinian for Hiroshima, Japan. This mission was piloted by Colonel Paul Tibbets, commanding officer of the 509th Composite Group, who named the bomber after his mother. The four-engine plane, followed by two observation planes carrying cameras and scientific instruments, was one of seven making the trip to Hiroshima, but only the Enola Gay was carrying a bomb—a bomb that was expected to knock out almost everything within a 3-mile (5-kilometer) area. Measuring over 10 feet (3 meters) long and almost 30 inches (75 centimeters) across, it weighed close to 5 tons (4.5 tonnes) and had the explosive force of 20,000 tons (18,000 tonnes) of TNT. The Enola Gay weaponeer, Navy Capt. Deak Parsons, was concerned about taking off with Little Boy fully assembled and live. Some heavily loaded B-29s had crashed on takeoff from Tinian. If that happened to the Enola Gay, the bomb might explode and wipe out half the island. Thus, Parsons, assisted by Lt. Morris Jeppson, finished the assembly and armed the bomb in the bomb bay after takeoff. After 6:00, the bomb was fully armed on board the Enola Gay. Tibbets announced to the crew that the plane was carrying the world's first atomic bomb. By 7:00, the Japanese radar net detected aircraft heading toward Japan, and the alert was broadcast throughout the Hiroshima area. Soon afterward, a weather plane circled over the city, but there was no sign of bombers. The people began their daily work and thought the danger had passed. 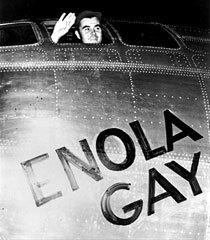 At 7:25, the Enola Gay was cruising over Hiroshima at 26,000 feet. By 8:00, Japanese radar again detected B-29s heading toward the city. Radio stations broadcast another warning for people to take shelter, but many ignored it. At 8:09, the crew of the Enola Gay could see the city appear below and received a message indicating that the weather was good over Hiroshima.